Let summer come one of these days! The summer pool (lake) toys are out, waiting for the showers to change to warm sun. Literally! 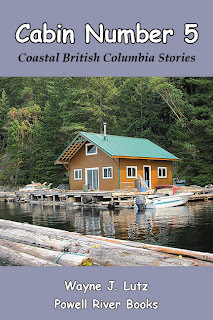 When we were troubleshooting a failed bilge pump in Wayne's Writer's Retreat boat called Gemini, we opened a box on the cabin deck housing a storage battery. Wayne reached inside only to discover a vary active hornet's nest. Almost every year, hornets take up residence near our cabin. We just never expected one hidden away like that. We both ran around to the front of the cabin before they swarmed to protect their nest. Wayne and I purchased NOMA solar powered outdoor Christmas lights at Canadian Tire. They seemed perfect for our off the grid float cabin. We love colourful lights at night, especially at Xmas, but our supply of solar and wind generated electricity is limited, especially during the winter with low sun angles and short (often cloudy) days. So, solar powered Xmas lights seemed just the ticket for us. I purchased a string of 50 lights (32 feet long) for $24.99 CAD. The white ones were $29.99, but I wanted the multi-coloured ones anyway. The small solar panel can be mounted on a ground spike or attached to a wall. The lights use LED technology, so the amount of power needed is much less than traditional incandescent bulbs. The box said one day of solar charging would produce three nights of lights. That sounded too good to be true, but we thought it was worth a try. Because we don't get a full day of direct sun in the winter, the Xmas lights last about an hour or so each evening. But in the summer there's plenty of colourful lights if we can stay up late enough to enjoy them. The system has an auto start and shut off feature. There's also a manual switch on the back of the solar panel. This is important if you want to conserve energy. I have a terrible knack for finding things that need fixing around the dabin. Well, it's not so terrible, but it always makes more work for Wayne. This trip I noticed that Wayne's Writer's Retreat boat called Gemini was riding low in the water. I stepped aboard and saw that the bilge was full from recent rains. Not a good for a boat! Wayne determined that the automatic bilge pump wasn't working. It runs off the solar powered battery bank stored in the rear of the boat. 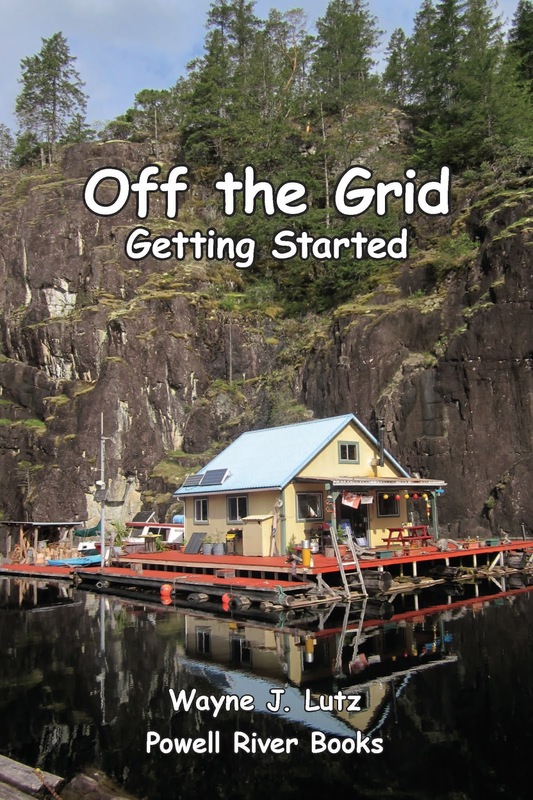 It's primary function is to supply our cabin with electricity. The little pump is never a drain, even on dark winter days. I've been taking classes at Whatcom Community College when I'm in Bellingham. Last week there was a free gardening class by Debra Olberg, an experienced gardener who works for nurseries, and has a company called Secret Garden Designs. I learned lots, and have already put one thing into practice. Slugs are a big problem in my float garden. I don't know how they arrived, but they are there to stay. Because my garden drains into the lake, I don't want to use poison. Debra's suggestion was to use a plastic tub to contain the poison. Then it could be disposed of (along with any deceased slugs) in the trash. That sounded like something that would be good for my garden. Here's my version. I used a plastic Cool Whip tub. I cut four small doors at the bottom. I've read that slugs don't like to crawl over rough surfaces, so I covered the bottom with duct tape to make it smoother. I didn't want to advertise for Cool Whip in my garden, so I got out my acrylic paints to make a quick change. A blue background gave me a canvas for my own label. In the garden, I added some slug poison and a sprinkle of water to moisten it. I capped the slug trap and put it next to my lettuce, one of their favourite munchies. How do you like my Slugotel? Slugs check in, but they don't check out. I'll let you know how it works. One morning, Stick bounded off the sofa and ran to the sliding glass door. That's not easy for a 21 year old cat, but he did it. We barely saw a blur pass by. I went around the cabin to see if I could discover what it was. Out in the woodshed I saw a squirrel climbing over our newly cut wood. I was trying to capture a shot when it come right up to me and posed not more than five feet away. Wayne and I like “wimpy” quad rides when we go out all on our own. We call a short (time and distance) ride a wimpy ride. 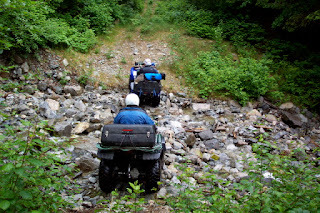 Even though we’ve had our quads for several years, we aren’t that familiar with the trails around Powell River. We’ve been cautious about heading out on our own, but we have two tools that give us more confidence. 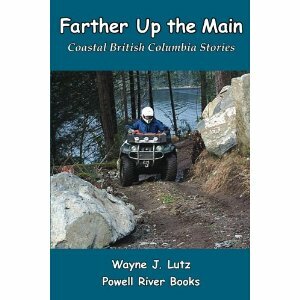 One is a great map book written by Dave from the Powell River ATV Club. 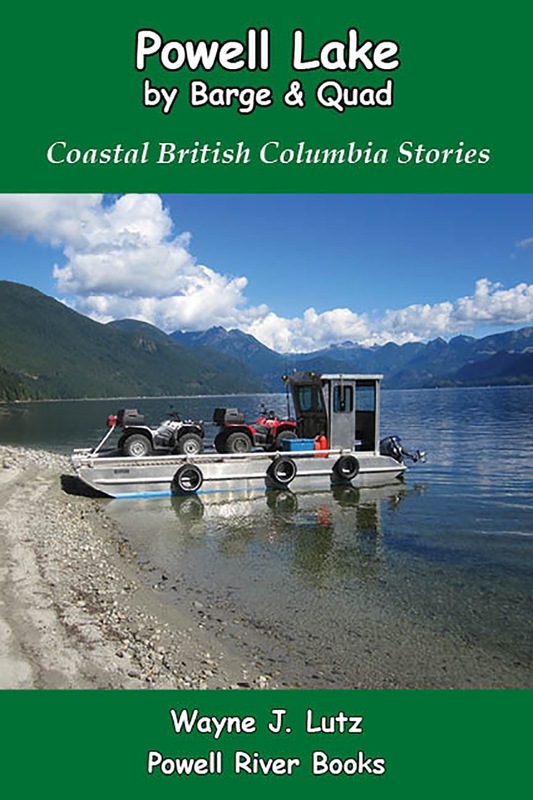 It’s called the ATV Trail Guide that is available at local ATV stores. The other item is a Garmin GPS. We went to visit George (Mr. GPS) at Marine Traders. He’s a Garmin expert and can help you find the right model for your needs. We purchased the topographical maps on a card and the City Navigator North America road maps on a CD. That way we got the software to save and manage routes and waypoints. Our Oregon 300 works with both Mac and PCs. Since we use Macs that was very important for us. We parked our truck in town near Edgehill School at the top of Abbotsford Street. We never guessed how beautiful the trail through the forest from this non-descript parking spot would be. Tall evergreen trees provide lots of shade for the lush fern and salal ground cover. There are many interconnecting trails in the area, so we used both map and GPS to stay on course. Along the way there was active logging, so we were watchful for trucks once we got to the logging road section. Where the Edgehill Trail System meets Duck Lake Forest Service Road (FSR), we entered the Washout Trail. It’s well marked with a cement sign. This trail follows an old railroad grade used by trains hauling timber for the Hasting Timber Company in the early 1900’s. High winds and forest fires in the 1920’s caused damage that can still be seen in the understory today. The trail is easy to moderate, with a few protruding roots to negotiate. From the Washout Trail we took Fred’s Trail down to Hammil Lake. Again, it is well marked with a wooden sign attached to a tree, but you have to watch for it. Fred’s Trail is narrow in places with larger roots to negotiate, but it is still in the easy to moderate category. Just after we entered the trail, we came to a bridge constructed by ATV riders over a fish-bearing stream. This is an example of how riders in the area respect and help preserve the environment. After our long, hot summer, there was no water left in the stream. We continued on Fred’s Trail to the Hammil Lake trail and followed it a short ways down to the lakeshore. The weather was cool and breezy, so we skipped a swim. Wayne tried a few casts while I had a pop and cookie break. Margy, Margy, how does your garden grow? and strawberries and lettuce all in a row. That is if Ms. Woodrat hasn't mowed everything down by now. Wow, that flight from Baja was a long one. I know we got a break each night in a marsh or grove of trees with all our friends, but I'm beat. What do you think about this place? I know it looks a little shabby on the outside, but it has a nice lived-in feel. And you couldn't ask for a better location or view. So, what do you think? Wanna stay? There's lots of insects to eat and friends for precision flight training each morning and evening. Yes, hon, this is the place. Come on in and see how cozy it is inside. It puts me in a nesting mood, if you know what I mean. Home sweet home. Our warm sunny spring weather has been interspersed with clouds and showers for the last week. On a recent trip to Seattle, the clouds had swirls and twists. 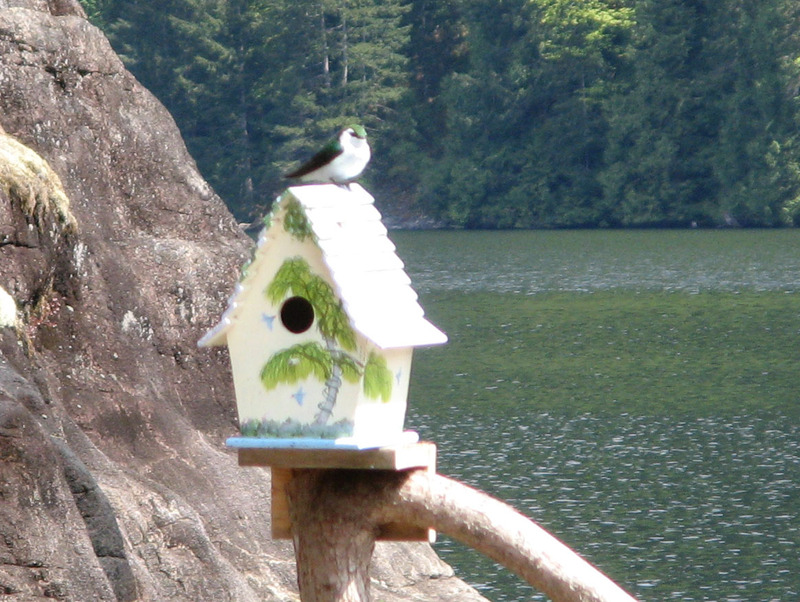 At the cabin, we have three kinds of swallows: Barn Swallows, Tree Swallows, and Violet-green Swallows. The Barn Swallows are easy to spot because of their tawny breasts and V-shaped tail. The Tree Swallows and Violet-green Swallows have more in common. On the fly, it's hard (at least for me) to identify one from the other. But when they roost, the unique white curl around the eyes of the Violet-green Swallow makes them stand out. 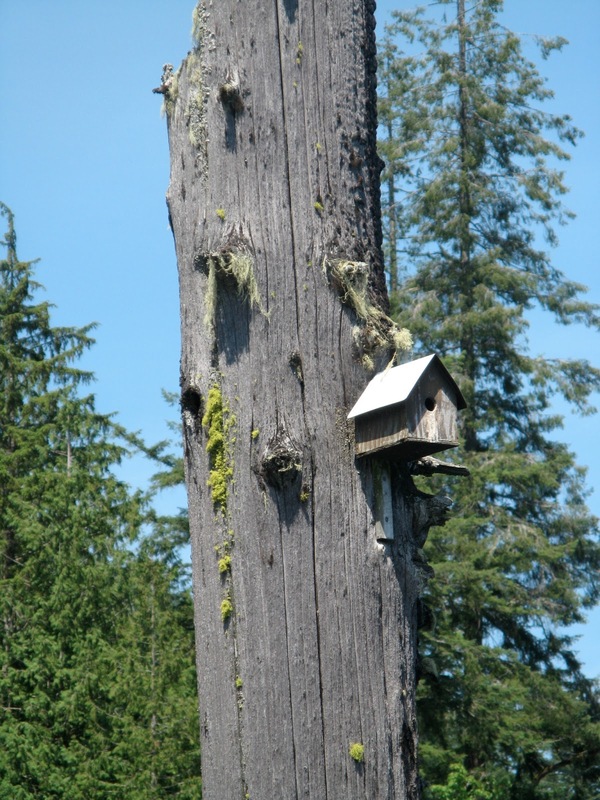 Like Tree Swallows, they build nests in vacant holes in dead trees, or nesting boxes. While Mom's inside with the kids, Dad often perches on top to keep an eye on things. Wayne and I got our boxes at a local store, but loggers make their own and place them on trees around Powell Lake. In Chippewa Bay, almost every snag had a box well above the high water mark. Our trusty Piper Arrow 997 spent the last six weeks in the avionics shop getting her radios refurbished. Immediately after getting her back, we were ready for an airplane camping trip. We had a good weather window last week (for flying and sleeping outdoors), so we packed up our gear and headed out. Camping by airplane is like the car camping I did as a kid. You take a tent, sleeping bags, air mattress, and other basic gear. At your destination, you set up camp. The difference is your "campground" is next to your plane on an airport. Our destination for the first night was Siletz Bay Airport (S45) at Gleneden, Oregon. It's one of our favorite spots when skies are clear because there's no IFR (instrument) approach. Gleneden Beach, Oregon is about two hours of flying time away from our home base at Bellingham International Airport. So far, we’ve had the camping area all to ourselves. That's our preferred place to stay, but we've also walked north along Highway 101 to the stay at the Salishan Spa and Golf Resort. We love to eat out. There are two excellent restaurants within walking distance. One is the at the Salishan. Our favourite is the Side Door Café. Cross Highway 101 where a trail leads up to the Gleneden Beach Loop and the restaurant. They are closed on Tuesdays, so we walked to the Boar's Head Deli across from the resort. It's only open for lunch, so we got a salad to take back to camp for dinner. There are many interesting things within walking distance of the airport. Take the Gleneden Beach Loop and walk past beautiful beachfront homes. Take the Loop south to Wesler Street and turn west to the Gleneden Beach State Recreation Site and the mighty Pacific Ocean. North of the Salishan Resort is Siletz Bay. It's a bird-watcher’s paradise. Whether you are looking for a dinner or overnight destination, try Siletz Bay State Airport at Gleneden Beach. When I started riding a quad, I had a snazzy red two-wheel drive Honda, but I couldn't climb uphill like the "big boys" with four-wheel drive. I had to get a running start and hope I made it to the top. It was always an uncomfortable feeling. Now I have a silver Kodiak 450 4X4 and can climb uphill a lot better. When Wayne and I follow our good friend John on the logging roads and trails around Powell River, he will raise his arm and extend four fingers to let us know it's time to shift into four-wheel drive for an uphill leg. 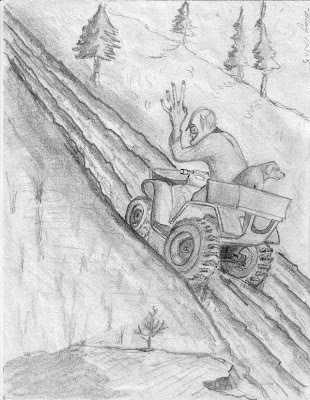 This illustration entitled "Four" from Up the Main was drawn by John's father, Ed. Wayne and I do most of our fishing near our float cabin home on Powell Lake. At the end of a warm spring or summer day, you'll find us out in our tin boat trolling for trout through First Narrows and out into the main lake. 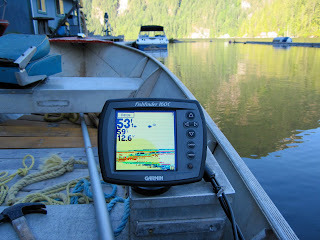 We use a Garmin Fishfinder 160C to help guide us to likely spots. Newer models are here. It's full colour display is easy to read and gives us information about depth, water temperature, and the bottom structure. It also displays images of cute little fish swimming below the surface. Dark ones are below the boat, outlined ones are swimming nearby. Don't ask me how that works, magic I guess. Wayne trolls with a rod holder and Scotty Laketroller downrigger. His line is down about twenty feet. I troll the old fashioned way by casting, playing out my line, and holding the rod. Whether using old fashioned fishing skills or new fangled technology, the fish are here.